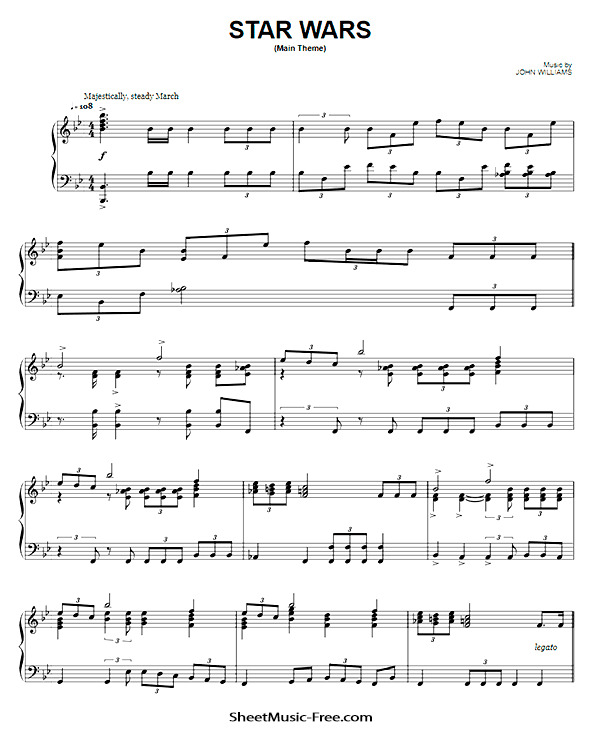 “Star Wars Piano Sheet Music” by Star Wars Theme, “Star Wars” composer John Williams and, in the case of the first two trilogies, performed by the London Symphony Orchestra. Star Wars Piano Sheet Music. The music of the Star Wars franchise is composed and produced in conjunction with the development of the feature films, television series, and other merchandise within the epic space opera franchise created by George Lucas. Released between 1977 and 2015, the music for the primary feature films was written by composer John Williams and, in the case of the first two trilogies, performed by the London Symphony Orchestra. In July 2013,Lucasfilm President Kathleen Kennedy announced at Star Wars Celebration Europe that Williams would be returning once more to score the seventh episode, Star Wars: The Force Awakens. Williams’ scores for the two existing trilogies count among the most widely known and popular contributions to modern film music. The scores utilize an eclectic variety of musical styles, many culled from the Late Romantic idiom of Richard Strauss and his contemporaries that itself was incorporated into the Golden Age Hollywood scores of Erich Korngoldand Max Steiner. While several obvious nods to Gustav Holst, William Walton, Sergueï Prokofiev and Igor Stravinsky exist in the score to Star Wars, Williams relied less and less on classical references in the latter five scores, incorporating more strains of modernist orchestral writing with each progressive score. The reasons for Williams’ tapping of a familiar Romantic idiom are known to involve Lucas’ desire to ground the otherwise strange and fantastic setting in well-known, audience-accessible music. Indeed, Lucas maintains that much of the original trilogy’s success relies not on advanced visual effects, but on the simple, direct emotional appeal of its plot, characters and, importantly, music. Star Wars often is credited as heralding the beginning of a revival of grand symphonic scores in the late 1970s. One technique in particular is an influence: Williams’s revival of a technique called leitmotif, which is most famously associated with the operas of Richard Wagner and, in film scores, with Steiner. A leitmotif is a phrase or melodic cell that signifies a character, place, plot element, mood, idea, relationship or other specific part of the film. It is commonly used in modern film scoring as a device for mentally anchoring certain parts of a film to the soundtrack. Of chief importance for a leitmotif is that it must be strong enough for a listener to latch onto while being flexible enough to undergo variation and development. A series of concerts which featured Star Wars music, Star Wars: In Concert, took place in 2009 and 2010. First performed in London, it went on to tour across the United States and Canada, last playing in London, Ontario, Canada on July 25, 2010.